Oh dear I have a little problem. The mast is turning in the slot and I didn’t notice it until I got back and looked at my photographs. I will have to investigate why when I next go to the boat. David Collin has very kindly suggested a possible culprit and solution below. 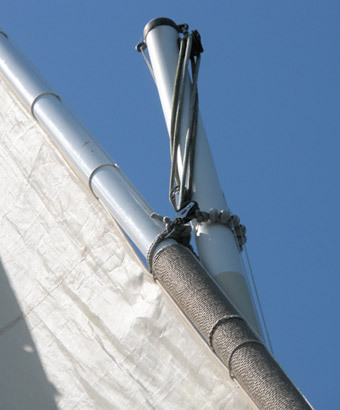 I once had a similar problem with my mast – it turned out that the little button at the top of the after end of the tapered mast base had become worn and was no longer locating in the little check in the mast step. I made a new one, screwed and resin fixed it into place and have had no trouble since. I see from your picture that you have burgee halyards. I found that they kept jamming in the parrel beads, thus making lowering sail difficult at times. I did away with the burgee halyards. I also find lowering the sail often difficult. Is another halyard indeed the solution? I‘m starting to think it hasn’t turned at all. Looking back at the building notes and plans it says to mount the mast head fitting with the rings at 90 degrees to the peg. That is where they are but I think it would be better to have the halyard mounted to the stern of the mast. Is your masthead fitting such that the halyard top is at the starboard side of the mast? The fitting at my masthead has two eyes for attaching halyards, one to port and one to starboard. I use the one at the starboard side for the main halyard, and that seems to work fine. I do find that the cheek of the upper block on the halyard causes wear to the side of the upper part of the mast, which I touch up and fill every winter to no avail! On the occasion I told you about when my mast was swivelling due to the failure of the locating button at the step, I was astonished at how readily the mast swivelled while sailing. Could yours have swivelled then returned to its original position later? I think some of the early Romillys had three eyes at the mast head fitting, one port, one starboard and one at the after end, but I cannot be sure of that. Do you have a burgee line on the port side of your mast? Next time I go to my boat I’m going to take mine off as suggested by David as it does interfere with raising and lowering the main sail. The line gets jammed in the parrel beads and causes friction. If it gets stuck on the way down I get hold of the leech and gently pull it down. When my boat was new, I found that the main halyard was very prone to twisting which formed kinks and caused a lot of fiction. With time, that problem eased as the twists worked their way out. The number of blocks in the halyard arrangement cause a fair bit of friction, and I have found it important to make sure that the blocks sit the best possible way, and to prevent them from swivelling, by the use of cable ties. I find that the boat must be heading directly into the wind for the sail to come down swiftly, and I often start the engine before dropping the main to enable me to do this. It is also easier to avoid the sail going over the side if she is heading directly into the wind! Do you haved the mizzen sheeted in fairly tight when trying to head into the wind to lower the mainsail?? I sail a San Francisco Pelican with a standing lug rig and the sail comes down easily on any point of sailing, but it is a 12’ boat with a 11’ yard. Have sailed a Nimble 20 yawl and the mizzen always turned the boat into the wind.